A unique wedding venue in Tasmania . . .
Stay a while and celebrate with family and friends on this beautiful property in the heart of the Cradle Mountain valley. 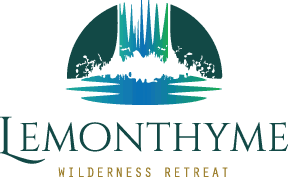 Located in Tasmania’s Cradle Mountain Valley, Lemonthyme Wilderness Retreat is the ideal location to hold your special day. The atmosphere is peaceful and serene, with a welcoming aura that soothes the soul and inspires the spirit. Choose a spot amongst the ferns, beside the waterfall, on the veranda or by the cosy log fire. Our Main Lodge is the venue for your reception, and features our “Whispering Woods” restaurant. The restaurant can hold up to 100 guests and can be configured to one or two rooms depending on the number of guests. 7 Wilderness Cabins - these have a queen size bed. Rollaways or sofa beds are available as well. 7 Wilderness Spa Cabins- these have a queen size bed. Rollaways or sofa beds are available as well. 4 x 2 Bedroom Cabins –these have 2 x king size beds which can be split into 2 x king singles. There are sofa beds in the lounge room. 1 x 2 Bedroom Cabin (no stairs) - 1 x queen, 2 x singles 1 x sofa. 1 x3 Bedroom Cabin - this has 1 x king split, 1 x a double bed and 2 x singles. 4 x Luxury Wilderness Suites – these have a king size bed (one has a king split – can be split into singles). If you need the room before this time it would be advisable to book it for the night before as well. We can offer this room for the same price as the wedding package states. We recommend that you do not to have your wedding before 3pm (if big) as the rooms will not be ready until 2pm. This allows guests to settle into their rooms and get changed before the ceremony starts. Please phone our Reception on (03) 6492 1112 if you have any questions or would like to make an appointment to meet with one of our staff. We endeavour to cater for all your dinner requirements. We invite you to peruse our menus and tailor your choices to create your perfect reception menu. Lemonthyme has an extensive wine list featuring fine wines from Tasmania, the mainland and New Zealand. You are welcome to choose beverages for your special day from these lists or supply your own. A corkage charge will apply. We also have a range of Tasmanian beers. Beers can be purchased over the bar. Spirits can be purchased over the bar also. Note: If there is no bar tab for the wedding drinks, it will be charged back to the guest’s rooms. Good quality white paper table napkins, tea light candles, greenery for table decorations (i.e. ferns etc) can be provided free of charge. We can also provide table linen - table cloths, linen napkins at additional costs, please ask one of our reception staff for costing on linen. You are welcome to have a wedding planner or table decorator. However the table decorator is to be in charge of setting up and cleaning up. If our staff members are required to help the wedding planner, with the set up or the clean up, additional fees will be charged. Guests are welcome to hire their own bands or Disc Jockeys. We do have names and numbers of bands or Disc Jockeys who are very happy to perform at Lemonthyme Lodge. Guests are welcome to use the far end of the Lodge room for dancing. Some guests have hired a dance floor – but this is not really necessary. We have names and numbers for all these. Just ask one of our staff at Reception. We can arrange transport to Waterfalls or to the Barbecue area in our 4 Wheel Drive Vehicles. A charge per hour, per vehicle will apply, starting from time requested. We do have an extra supply of white chairs that can be hired and used for the Ceremony. The area close to the main lodge at Lemonthyme is a smoke – free zone. There is a designated smoking area at the Western end of the Barbecue area. We stress that guests do not smoke in the No Smoking areas and do not drop cigarette butts on the ground or on the timber decking. We suggest that your Master of Ceremonies mentions this in his welcoming speech. We can offer a babysitting service for you or your guests, *based on availability. Pricing is per hour with a minimum of three hours. If discounted accommodation is cancelled between 30 and 15 days prior to arrival a 25% cancellation payment is required. If discounted accommodation is cancelled less than 15 days prior to arrival a 50% cancellation payment is required. If full rate accommodation is cancelled less than 3 days prior to arrival a 100% cancellation payment is required.